Point Pleasant junior Dawson Wilson hits a serve during an April 11 match against Huntington Saint Joseph at The Courts in Point Pleasant, W.Va.
CHARLESTON, W.Va. — Even without a title, it was still a remarkable finish to an incredible season. Point Pleasant posted a collective 5-4 overall record, had one state finalist and another pair of semifinalists in the Class AA-A field at the 2018 WVSSAC tennis championships held Thursday through Saturday at Coonskin Park in Kanawha County. The Lady Knights went 3-3 overall in a trio of divisions while tying Bluefield for sixth place with three points. The Black Knights, conversely, went 2-1 overall and joined Elkins in a tie for 10th place with two points. Winfield captured both Class AA-A team crowns as the Generals (17) and Lady Generals (13) rolled to seven state championships, including a quartet of doubles’ titles. Parkersburg Catholic was the runner-up in both competitions with 10 points apiece. Both Point Pleasant squads came away with wins at the same state tournament for a second consecutive postseason, and the program also landed its first state finalist since Leah Eddy won the third singles championship in 2005. 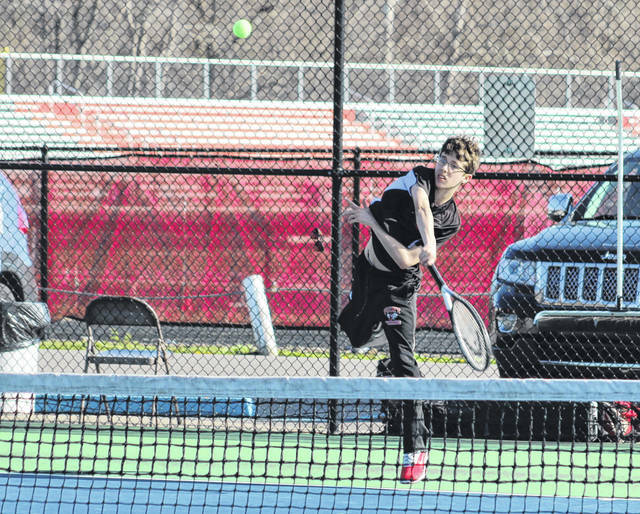 It is also the seventh time in 11 years — as well as the third time in four seasons — that the Red and Black have been represented at the WVSSAC tennis tournament. The Lady Knights had a busy weekend with two athletes competing in singles competition, which led to pair of top-four finishes. Senior Bailey Barnett opened second singles play with an 8-2 victory over Tetrault from Oak Glen, then earned an 8-6 victory over Adkins of Charleston Catholic. Barnett — who also reached the second singles semifinals last spring — eventually fell to Sprout of Parkersburg Catholic in the semifinals. Sprout went on to win the Class AA-A second singles title. Junior Sarah Deem earned a 6-1, 6-1 victory over Reed of Berkeley Springs in her first-ever state match, which advanced her to the finals in fourth singles. Despite a back-and-forth match, Noone of Bridgeport ultimately held off Deem for a 7-5, 7-5 victory in the championship event. Deem and junior Caroline Foreman also dropped their opening-round match in second doubles to Riggs and Hale of Magnolia. After watching her girls put together a 9-5-1 regular season, PPHS coach Kim Napora was proud of the way things went for his troops at the state meet. The 12th-year mentor noted that it will be hard to replace seniors like Barnett, Olivia Pyles and Danielle Marcum — a trio of four-year varsity starters — but she also feels the program is in better shape moving forward because of those upperclassmen. “We had a lot of individual success this year and we had a lot of team successes as well. It was a really good year for the girls program,” Napora said. “We were blessed with a group of girls who were already playing tennis before they came into the program, and they have continued working on their game over the course of their careers. This weekend was the end result of a lot of hard work, and I think it really showed in the end. The Black Knights were represented by junior Dawson Wilson, who made it to the semifinals last spring in third singles. This year, as a first singles competitor, Wilson knocked off a regional champion with an 8-3 win in his opening match over Goldzien of Petersburg. Wilson then defeated Carr of Elkins by an 8-1 count to reach the semis. Wilson ultimately fell to Sam Bowman of Winfield in the semifinals. Bowman went on to win the first singles title and was also part of the first doubles championship team. After an 8-7 regular season with limited personnel, PPHS coach John Fields noted that Wilson was the brightest spot for the Black Knights in the regular season. As the 11th-year mentor noted, it’s been a while since Point Pleasant could say that it legitimately appears to have one of the four best singles players in the state — and he still has another season to go. The Black Knights lose only senior Hayden Fetty — a multi-year starter — from the 2018 boys roster.